"My Heart Cries For You" gave Guy Mitchell his first million seller when it reached number 2 in 1951, after having been released in December 1950. However, Dinah Shore recorded the number earlier, on 29 October 1950, just 4 days before Mitchell's own trip to the recording studio. But there's a question-mark, for Vic Damone also recorded the number at about this time and perhaps even earlier than Shore. Unfortunately, data for his Mercury recording session is lacking and so it is not possible to find the date. The song was written by Carl Sigman and Percy Faith, an adaption of the melody from "Chanson de Marie Antoinnette," purported to have been written by the 18th century French queen. 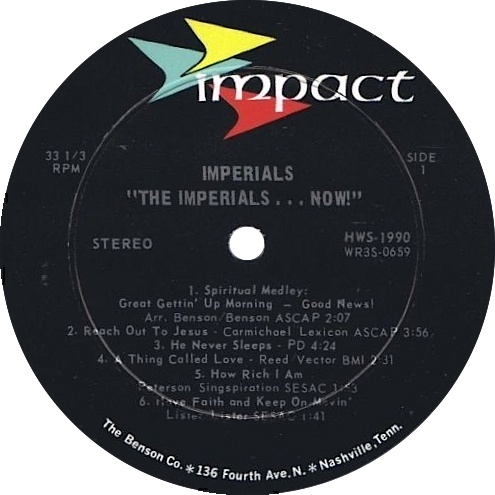 Elvis's version is an informal recording, made in Rocca Place, Hollywood. It was discovered on an acetate by Joan Deary of RCA records when she searched Graceland after Elvis's death, in the hope of finding some overlooked recordings. Can you provide a recording date for the Damone version? contact me. Junior Parker was born Herman Parker on 27 May, 1932, in either Clarksdale, Mississippi, or West Memphis, Arkansas (sources differ). Involved with the Blues since his teenage years, Parker formed his own band, the Blue Flames, in 1951. Sam Phillips signed the band to Sun Records in 1953. 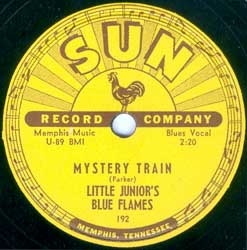 The original version of "Mystery Train" was recorded on 5 August, 1953, and released as a single on Sun 192, with the performers listed as Little Junior's Blue Flames (Parker himself was the vocalist). 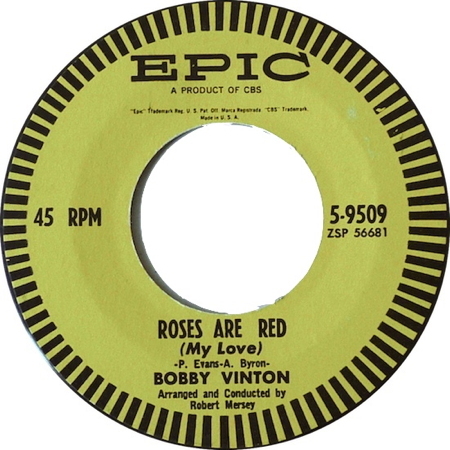 The B-side was "Love My Bay," a strange coupling in some ways, as they were basically the same tunes with different lyrics—"Love My Baby" was played more frantically, however, and the guitar playing on the track clearly influenced that on Elvis's own "Mystery Train" (played there by Scotty Moore). Can you provide recording dates for the remaining original candidates? contact me. 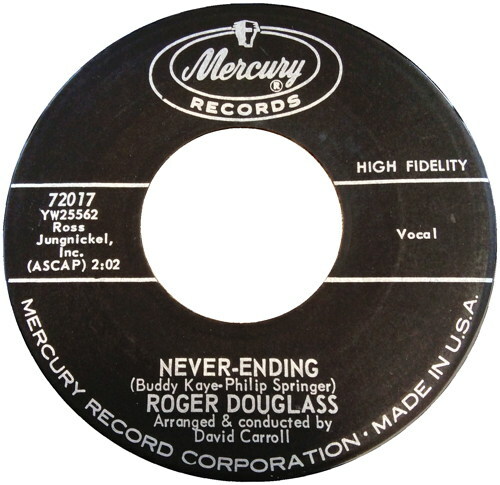 Roger Douglass seems to have made just ten recordings on three different labels between 1960 and 1965, one of which was the original version of "Never Ending," which was released with the addition of a hyphen, as "Never-Ending," in 1962 on Mercury 72017, as the B-side of "Church Bells Played Me The Blues." Any more information about Roger Douglass? contact me. The song on which "No More" was based is "La Paloma," written By Sebastián Yradier, a Basque and student of the Madrid Conservatory, who was influenced by the music of Havana, Cuba, during his travels in the 1850s. He wrote the song and performed it for the first time in Havana in 1855; it was first published in 1859. The first sound recording of "La Paloma" was made as a cornet duet by unidentified players for Emil Berliner's United States Gramophone Company on 3 November 1894 (Berliner 243 7-inch disc), but the first vocal recording was by Ferruccio Giannini. His recording was made on 4 May 1896 and was issued on Berliner 913 (7 inch). Giannini was a Italian tenor who emigrated to the USA in 1885 to become one of the first singers to be recorded on disc in 1896. See also "Santa Lucia." Englishman John Francis Wade wrote the words and music for "Adeste Fideles;" these were published together in 1782. 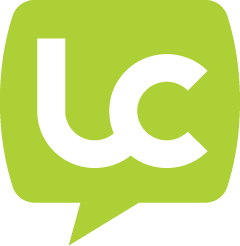 The original Latin words were translated into English by Frederick Oakley in 1841. 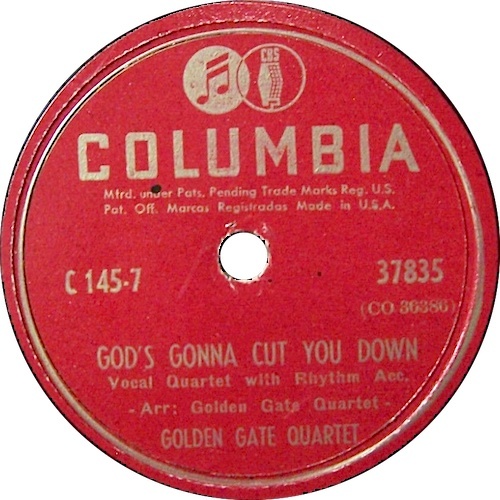 Although crooner Bing Crosby famously recorded "O come..." with English words in the 1940s, the number was originally recorded as an instrumental over forty years previously: a "Brass Quartet from Sousa's Band" made the original recording on 22 July 1897 and this was released on Berliner 826 as a 7-inch disc. This recording, titled "Adeste Fidelis," [SIC] is an instrumental version of the number. The Berliner company was also responsible for the first vocal recording of "Adeste Fidelis," [SIC] made on 29 November 1899 by the Original Lyric Trio with William Hooley, and released on Berliner 0771. Don't look for this title on the From Nashville To Memphis CD mentioned above, as it is not listed! Elvis gives us just a couple of lines, sung comically, before getting into Hi-Heel Sneakers. Bobbie Gentry, born Roberta Streeter in 1944, never matched the success of her self-penned first hit, "Ode To Billie Joe." But what a song! It won her four Grammy Awards in 1967: Best New Artist, Best Female Vocal Performance, Best Contemporary Female Solo Vocal Performance and Best Arrangement Accompanying A Vocalist. 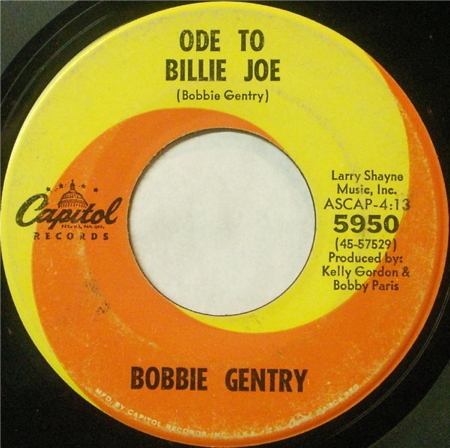 Bobbie Gentry recorded the original version of her self-penned piece of Southern Gothic, "Ode To Billie Joe," on 10 July, 1967, and it was released as a single on Capitol 5950. Elvis seems to have liked the song, too (perhaps because it mentions Tupelo). Not bad for a song that was in fact released as a B-side (the A-side being "Mississippi Delta"). Gentry's single version clocks in at almost four and a quarter minutes, but her original composition had eleven verses and ran around seven minutes. This traditional song became very popular in1969 when The Edwin Hawkins Singers, featuring Dorothy Morgan, scored an international multi-million seller with the number. The Singers had recorded "Oh Happy Day" in 1967, together with seven other traditional gospel songs, in an effort to raise funds for the choir, then known as the Northern California State Youth Choir. The song received a Grammy award for Best Soul Gospel song of 1969. 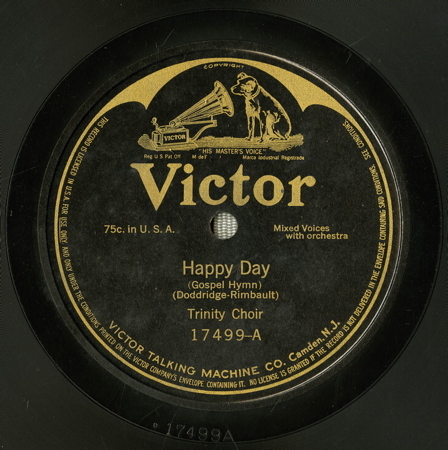 The first known recording, however, dates from July 1913 on Victor 17499. The song uses the words to a mid-18th century hymn by Philip Doddridge, set to a tune by Edward Rimbault, who also added a chorus. Edwin Hawkins' version ignores the verses and only uses Rimbault's chorus, which is repeated often. Elvis never made a studio recording of "Oh Happy day," but he sang it occasionally in concert and thought about using it in his 1968 TV special. An earlier recording? contact me. This is not the same song as the perhaps more famous one best known by The Edwin Hawkins Singers. 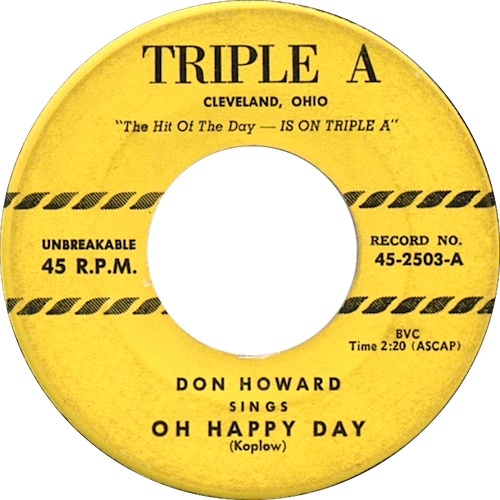 18-year old Don Howard Koplow was said to have written "Oh Happy Day" himself. He recorded it in his garage in Cleveland, Ohio and the number was originally released on the Triple A label, but met with very little success until it was picked up by Dave Miller of Essex Records in Philadelphia. It became a huge hit and was covered by numerous other artists at the time. Don Howard was signed to Coral, but did not enjoy another hit. In 1953, Nancy Binns Reed claimed that she had written the song during a summer-camp in the mid-1940s. Later recordings and sheet music included both Koplow's and Reed's names in the credits. The recording by Elvis is an informal one in which he sings just a brief extract of the song during the rehearsal period for the "Singer Presents Elvis" television show. He is known to have sung the song on at least one occasion in concert, on 8 May 1976 in Lake Tahoe. Who really made the first commercial recording? contact me. The number was written by Phillip Brooks and Lewis Redner in 1868, following a visit by Brooks to Bethlehem in 1865: Brooks first wrote a poem and then asked Redner to put it to music. It was first performed on December 27th 1868. A medley entitled, "Christmas Songs and Carols" and including "Christians, Awake!" 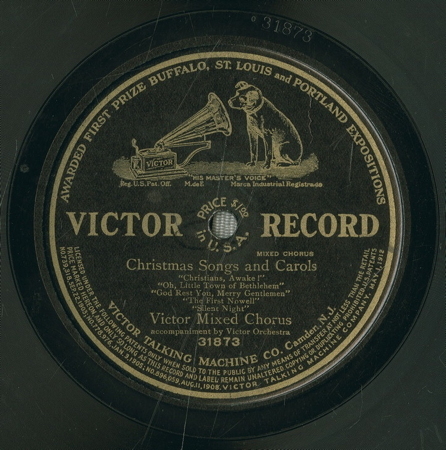 "Oh, Little Town Of Bethlehem," "God Rest You, Merry Gentlemen, "The First Nowell," and "Silent Night" was recorded in October 1912 and issued on Victor 31873, with performing credits showing "Victor Mixed Chorus accompaniment by Victor Orchestra." Don Gibson was born on 3 April, 1928, in Shelby, North Carolina. 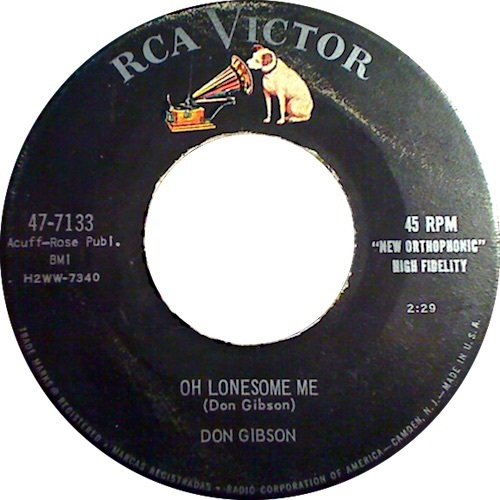 Gibson recorded his self-penned original version of "Oh Lonesome Me" on 3 December, 1957, in Nashville, with producer Chet Atkins. During the same session, he also recorded "I Can't Stop Loving You," which later became a huge hit for Ray Charles. The backing singers on the tracks were the Jordanaires. 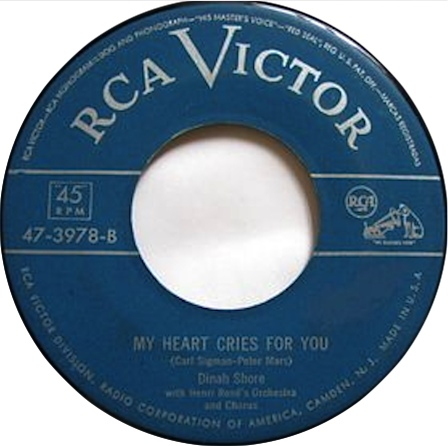 The two recordings were released as A- and B-sides of RCA Victor 47-7133 (45 RPM) and 20-7133 (78 RPM) in early 1958. Elvis's recording of "Oh Lonesome Me" is an informal one, made on a domestic tape recorder during his military service, when he was staying at the Hotel Grunewald, in Bad Nauheim, Germany. The exact date of the recording is not known. Don Gibson died on 17 November, 2003. Old MacDonald is a popular children's song in English-speaking countries, in which animal sounds are strung together to form a sort of memory game. Fortunately the studio bosses didn't go quite that far with Elvis... A surprising array of artists have recorded various versions of this number, including Frank Sinatra, who had a Billboard Hot 100 charting in 1960 and Tony Curtis, who sang it in the 1963 film "Captain Newman M.D." together with the neuropsychiatric ward, which seems utterly appropriate. 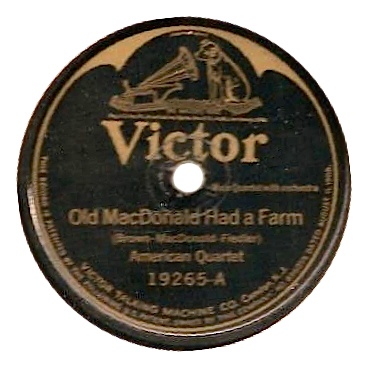 The American Quartet consisted of Billy Murray (vocalist: tenor vocal), John Young (vocalist: tenor vocal), Steve Porter (vocalist: baritone vocal) and Donald Chalmers (vocalist: bass vocal) when they recorded their version, titled "Old MacDonald Had a Farm," on 30 October 1923, in Camden, New Jersey. The number was released on the 10" Victor 19265 coupled with "The Green Grass Grew All Around." The story is that Elvis performed this as a ten year old at the Alabama State and Dairy Fair in Tupelo, winning second prize for his performance. Elvis chronicler Bill Burk, however, asserts that his research proves that Elvis came fifth that day and wore glasses, to boot! 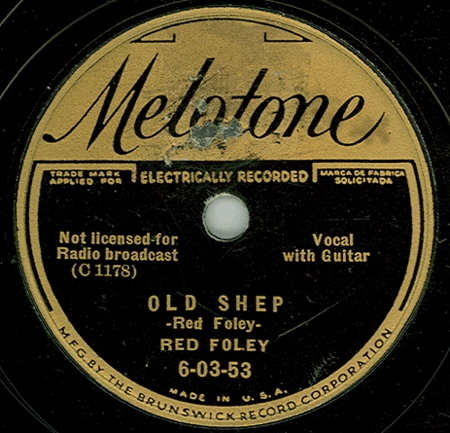 Red Foley's 1941 Decca recording of "Old Shep" is usually indicated as the original, but Foley had already recorded the number on 9 December 1935 for Conqueror (catalogue number 8631), which it was released on the Melotone label, number 6-03-53. The song, which he wrote in 1933 with Willis Arthur, was about his own German Shepherd, named Hoover, that had been poisened by a neighbour. Note that some reports refer to Willis Arthur, others to Arthur Willis. contact me. "On The Jericho Road" was written by Don and Marguerete McCrossman in 1928. The full title is, "As We Travel Along On The Jericho Road." It was copyrighted in 1933 by the Stamps-Baxter Music Company, with words and music credited to Donald S. McCrossman (what happened to Marguerete?) and with the arrangement credited to Luther G. Presley. 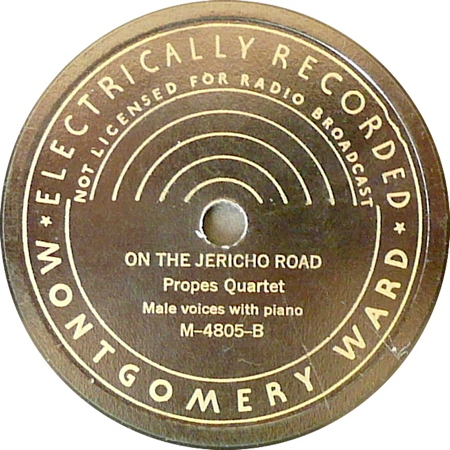 The Propes Quartet original version was recorded on 1 August 1934 and released on Bluebird 5612 and Montgomery Ward 4805. Any information about the Propes Quartet? contact me. It is not known who wrote the words of "On Top Of Old Smokey," but the tune is an old folk song from the hills of the American South. It is perhaps best known in the 1951 hit version by the Weavers, a folk group that included Pete Seeger. However, the first recording of the number seems to have been made in October 1925 by George Reneau, who was known as The Blind Musician Of The Smokey Mountains. 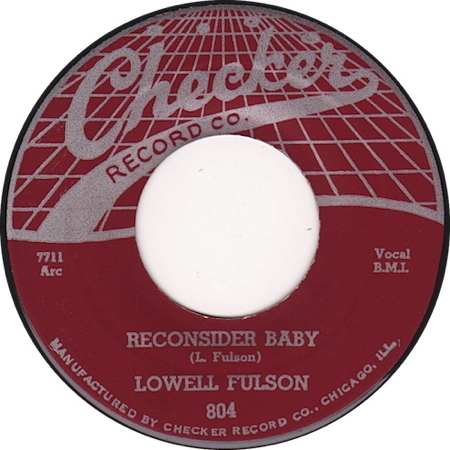 The track was released on Vocalion 5114. Reneau recorded the number again two years later, as a duo with Lester McFarland, under the name the Gentry Brothers. 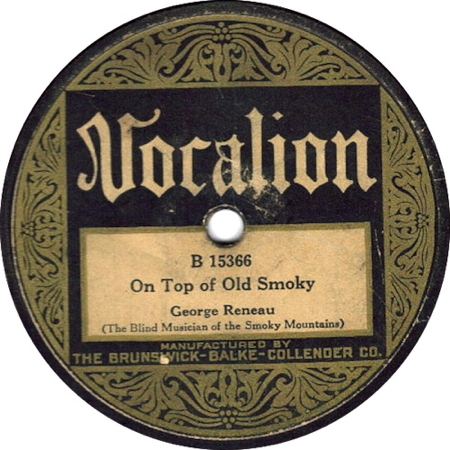 The tune used for "On Top Of Old Smokey" is very similar to another song called "The Little Mohee" recorded on 21 April 1927 by Buell Kazee for Brunswick. 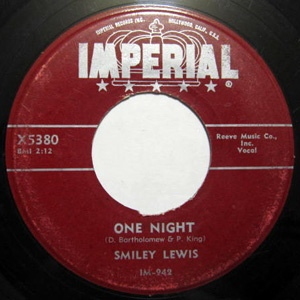 Elvis did not make a full recording of "On Top Of Old Smokey," providing just about 10 seconds of the song during a scene in his 1962 film "Follow That Dream." This is regarded as Elvis's favourite Hymn from his army days and he had a copy of the Harmonizing Four's recording of it in his German home. Their version, which was titled "All Things Are Possible," was released on the Vee Jay label with Jimmy Jones singing the bass part. Writer Daniel Paul Rader was born in 1878 or 1879 (though most biographies give 1877 as his year of birth) and lived to be 60 years old. He was a powerful evangelical preacher in the early twentieth century and wrote numerous modern hymns, including "Only Believe," which dates from 1921. 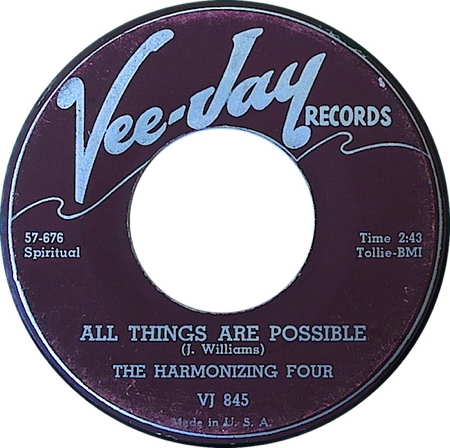 The Harmonizing Four recorded the song as "All Things Are Possible" on VeeJay 845; the B-side was "Farther Along," which Elvis also recorded. 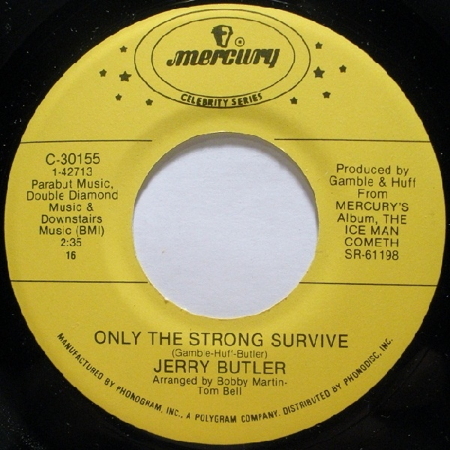 Jerry Butler, nicknamed "The Iceman" for his cool delivery, recorded "Only The Strong Survive" in November 1968. He had a million-seller with this number in 1969, the same year that Elvis recorded his version. Butler is now a Chicago County Commissioner, but also continues to make records and perform. The Five Keys were formed in Virginia. They were originally called the Sentimental Four and consisted of two sets of brothers. Following a change of name and successes in talent contests, they were invited to record for Aladdin Records in Los Angeles in 1951. Their first release, "Glory Of Love," was a hit, but none of their following singles matched that success. 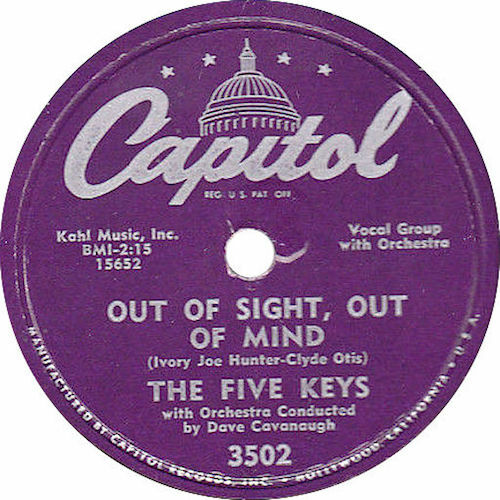 The group underwent several personnel changes before moving to Capitol Records in 1954, a move that led to numerous hits, including "Out Of Sight, Out Of Mind," which made number 12 in the R&B charts and number 30 in the pop charts. The Five Kings left Capitol in 1958 and underwent further personnel changes, but no more hits. The Jimmy Wakely number of the same title, released in 1953, seems not to be the same song. Created in a moment of inspiration, "Over The Rainbow" almost didn't make it to Oz along with Judy Garland in the fantastic 1939 film "The Wizard of Oz"—first of all the lyricist, E. Harburg, didn't think that Harold Arlen's tune fitted the film, then MGM deleted the number from the print three times, before deciding to include it in the final version. The song went on to win an Oscar for the best film song and was later chosen as the best song of the 20th century by the American Record Industry. 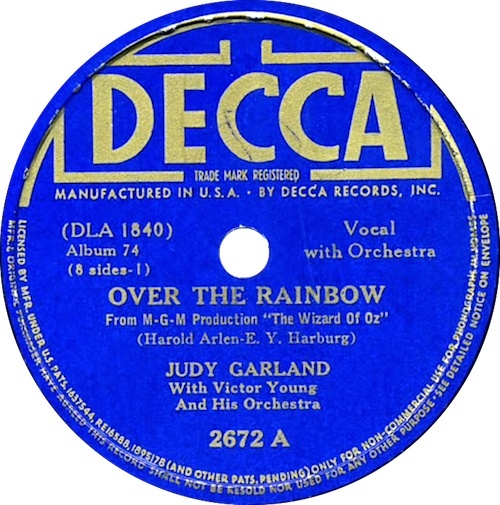 Garland made an initial recording of "Over The Rainbow" on 7 October 1938 for use in the film, but it was a later studio recording, made on 28 July 1939, that was released as a Decca single (2672) in September 1939, and as part of a 4-disk "Wizard Of Oz" album set the following year. Elvis didn't get too far with the number, singing just one line of it during a performance in 1972. Before becoming The Rivingtons, the members of the group had already enjoyed recording success as The Sharps with the number "Little Bitty Pretty One," in 1957. They were then heard on several Duane Eddy recordings, performing handclaps and the so-called "rebel yells" such as those used on "Rebel Rouser" in 1958. Their original recording of "Papa-Oom-Mow-Mow" was released on Liberty 55427 around the middle of 1962. 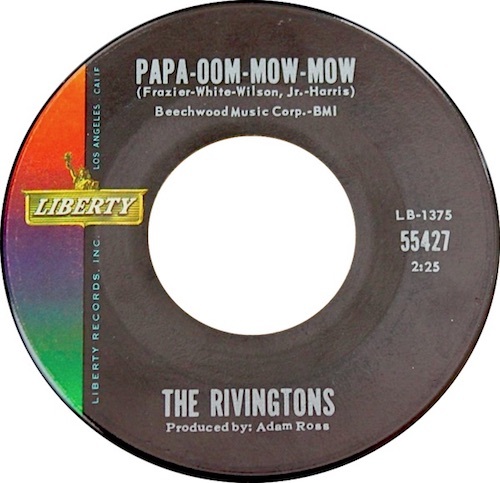 Despite several other releases during the rest of the 1960s, the Rivingtons were unable to match the success of "Papa-Oom-Mow-Mow" and their recording career came to an end. The song itself, however, gained a sort of cult status and has since been recorded by artists as diverse as The Beach Boys, Gary Glitter, and the Muppets. The Trashmen copied the song to create their own smash success with "Surfin' Bird." Elvis sang just the title line during take 26/28 (exact take is unknown) of "Goin' Home" during the "Stay Away Joe" sessions. Can you provide an accurate recording date for The Rivingtons' version? contact me. Elvis would occasionally play a tune on his guitar while hanging around (contrary to popular opinion, he wasn't at all bad on the instrument—it was his solid rhythm, after all, that drove the early Sun recordings, a fact sadly forgotten by many commentators!). 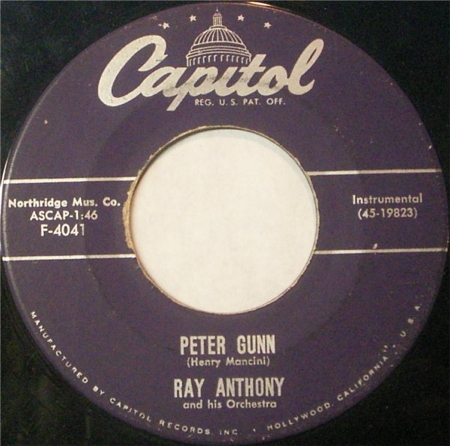 Peter Gunn seems to have been a particularly popular "filler" and the 1968 recording is just the first of several versions available. The original music was the theme tune to a very popular TV show called, surprise surprise, "Peter Gunn" starring Craig Stevens and Lola Albright—who later appeared in Elvis's "Kid Galahad." Henry Mancini, who composed the number, played the TV theme, which he recorded on 26 August 1958, but Ray Anthony recorded his original version three weeks earlier on 4 August, releasing it on Capitol 4041 (45-19823). Pop guitarist Duane Eddy had a big hit in 1960 with the number and the tune has been recorded and re-recorded many times since. Johnny Ace was born John Alexander on 9 June, 1929, in Memphis, Tennessee. He played in B.B. Ling's band, but when King left Memphis, Alexander, as he was still known, took over and renamed the band The Beale Streeters. In 1952 he changed his professional name to Ace and signed to Duke Records, garnering immediate success with "My Song" and following up with numerous other big hits. Whilst touring with Big Mama Thornton, Johnny Ace killed himself with a revolver on Christmas Day, 1954, the result of either a game of Russian Roulette, or plain stupidity when playing around with the gun. 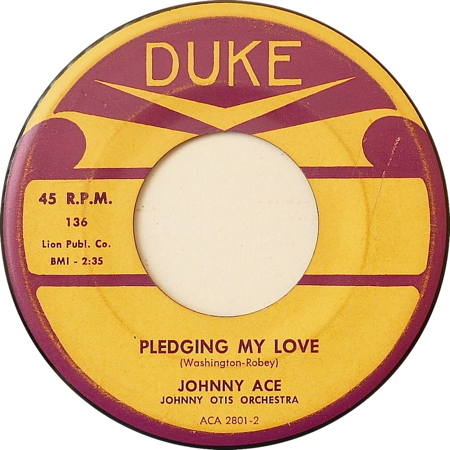 Earlier that same month, Johnny Ace's original version of "Pledging My Love" was released as a single in both 45 and 78 rpm formats on Duke 136. Matt Monro was born Terence Parsons in Shoreditch, London, on 1 December, 1930. The winner of a radio talent show in 1953, Monro went on to become the featured vocalist with the BBC Show Band. 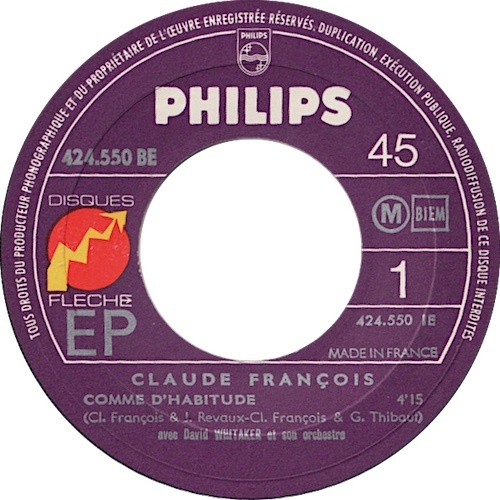 Although recording success eluded him in the 1950s, he was asked in 1960 by George Martin to record for the Parlophone label. 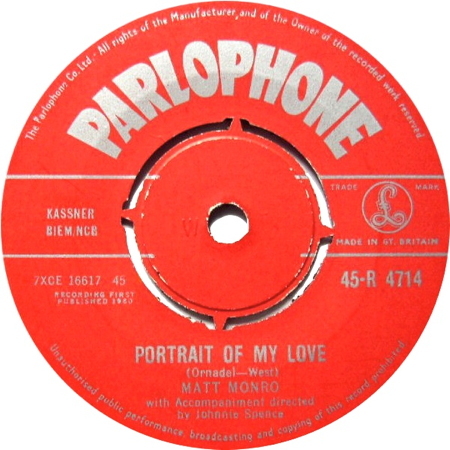 His second single for that label was his original version of "Portrait Of My Love," released in December 1960 on Parlophone R 4714, which reached number three in the UK charts. "Portrait Of My Love" was written by a British pair, Cyril Ornadel and Norman Newell (pseudonym David West). Matt Monro died on 7 February, 1985. Steve Lawrence took the number into the top ten of the American Hot 100 in 1961. An informal recording of Elvis singing this song and accompanying himself on the piano was made at a backstage rehearsal in Las Vegas in August 1972. The master of Rock 'n' Roll lyrics wrote this during his stay in prison for allegedly transporting a minor across state boundaries. Like almost all of Berry's numbers, it contains some stunning couplets and inventive rhymes. A masterpiece, really. It became his first single after his release from prison. 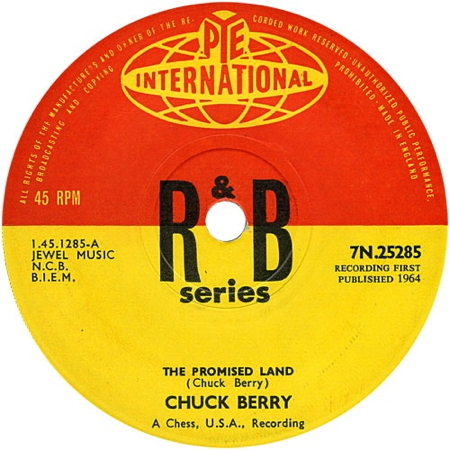 There are suggestions that Chuck "borrowed" the tune of "Wabash Cannonball" for his "Promised Land." Not that "Wabash Cannonball" was an original number itself, it having been based on a song called "The Great Rock Island Route" (again, perhaps based on an earlier melody), first published as sheet music in 1882, with words and music by J. A. Roff. This was rewritten by William Kindt in 1904 as "Wabash Cannon Ball." 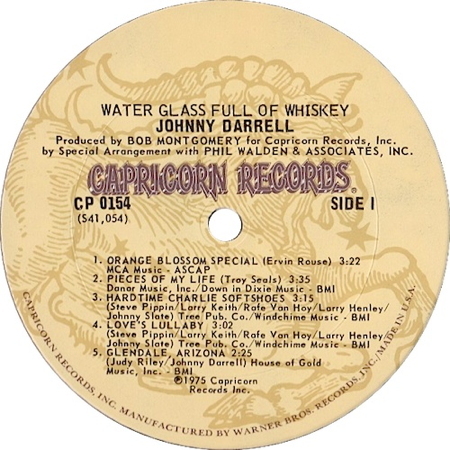 The first recording seems to have been made by The Carter Family on 24 November 1929, using the now more common title, "Wabash Cannonball." Elvis covered numerous Berry numbers—see also Brown Eyed Handsome Man; Johnny B. Goode; Long Live Rock And Roll (School Days); Maybellene; Memphis, Tennessee; Too Much Monkey Business. Writer JohnFogerty was lead singer with Creedence Clearwater Revival. 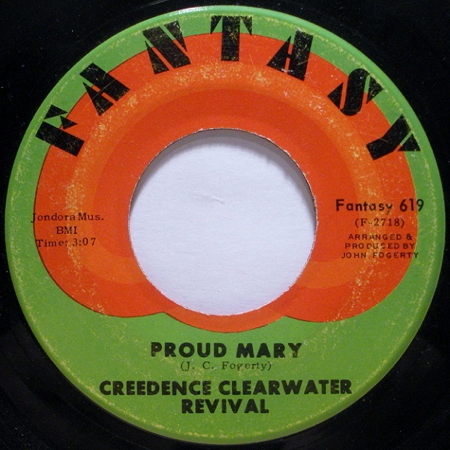 They reached number 2 in the US Hot 100 with this track in 1970. "Puppet On A String" from 1920? Well, yes and no. Tepper and Bennett not infrequently resorted to tunes in the public domain when providing numbers for Elvis and this is another of those cases. The melody of Puppet is based on the lullaby "Hush Little Baby," the origins of which are lost in time. The song was collected by Cecil Sharpe in 1916, when it was sung by a Mrs Julia Boone. The first commercial recording appears to have been made on 5 April 1920 for Edison Diamond Discs (80560) by Edith McDonald and released with the title, "Hush, Little Baby, Don't You Cry." The tune and the lyrics have inspired numerous songs, in addition to Elvis's own version, including "Hambone," "Bo Diddley," "Mockingbird" and the 1964 "Fool, Fool, Fool" (a totally different song to Elvis's "Fool, Fool, Fool" of a decade earlier). Like myself, you might be surprised to learn that this number is so young — I thought it was a gospel traditional! I am sure I was singing it as a child, and that's ages ago! Anyway, in 1971 a Canadian gospel group called "Ocean" had the biggest hit with this number, which they had recorded on the Kama Sutra label. Anne Murray beat them to the recording studio, making her original version in the spring of 1970. Murray's original was first released as part of her third LP (her second for Capitol), "Honey, Wheat, and Laughter," on Capitol ST 6350, which was only released in Canada. Murray had wanted "Put Your Hand" to be issued as the single follow-up to "Snowbird," and Capitol Canada backed her decision. However, Capitol USA disliked the number and prevented its release until the next two singles flopped in the USA. Only then did they issue "Put Your Hand" but merely as the B-side of "It Takes Time." By then, Ocean had already had their hit with "Put You Hand." Gene MacLellan, who wrote the song, also wrote "Snowbird" for Anne Murray, which was also recorded by Elvis. The song was written for Alfred Hitchcock's 1956 remake of his own 1934 film "The Man Who Knew Too Much." The 1956 version starred James Stewart and Doris Day. The song won the Best Song Oscar. Elvis's version is a home recording, made when he was in Germany during his army service, and was never intended for release. Indeed, it has not been released officially and is available only on the above unofficial CD. 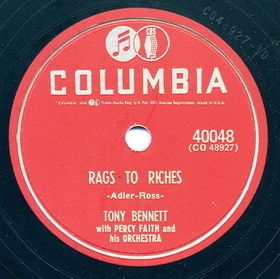 Richard Adler and Jerry Ross met in 1950 and after some smaller successes, created this huge hit for Tony Bennett in 1953, remaining at the top of the singles charts in the USA Billboard for no less than eight weeks. Adler and Ross went on to write the score for the musical, "The Pajama Game." Tony Bennett was born Anthony Dominick Benedetto on 3 August, 1926, in Queens, New York. After the war, he concentrated on singing and signed with Columbia Records in 1951, becoming very popular and scoring a number of hits, including his original version of "Rags To Riches," which was recorded on 17 March, 1953 and released as a single on Columbia 40048 later that year. Part of the reason for the great success of "Rags To Riches" was the unusual arrangement provided by Percy Faith, whose orchestra also accompanied Bennett on his recording. Percy Faith was born on 7 April, 1908, in Toronto, Canada. After suffering burns to his hands at the age of eighteen, he turned from being a promising concert pianist to conducting an arranging. He gained fame first with the Canadian Broadcasting Corporation, but in 1940 moved to Chicago, in the USA (he became a US citizen in 1945). Following a brief period with Decca Records, he moved to Columbia Records, recording his own albums and providing arrangements and accompaniment for pop singers throughout the 1950s and 1960s. Percy Faith died on 9 February, 1976. Little Richard was born Richard Penniman on 5 December, 1932, in Macon, Georgia. in 1947 he was spotted by Sister Rosetta Tharpe when he was singing as a warm-up act prior to her concert at Macon City Auditorium. She invited him to sing during the concert. 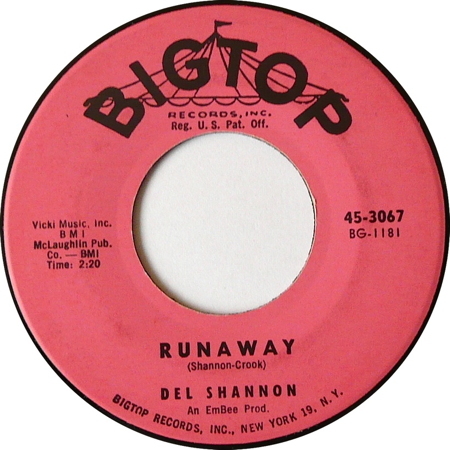 In late 1951 and early 1952 he recorded eight tracks for RCA Victor, but these enjoyed little success and he moved to Peacock Records, recording a further eight numbers with a group he called The Tempo Toppers. Again, success eluded him, so in 1955 he sent some demo recordings to Specialty Records. On 14 September 1955, Little Richard recorded his original version of "Tutti Frutti" for Specialty, which was released as a single in November 1955 and became an instant hit. 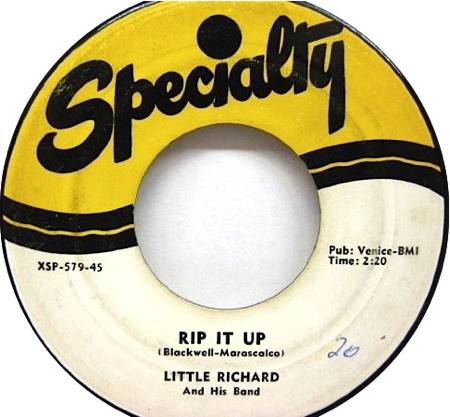 Hit after hit followed on both sides of the Atlantic, including "Ready Teddy," which was recorded by Little Richard on 9 May, 1956, and released as one side of his Specialty SP-579 single, the other side being "Rip It Up." What a combination! His chart success faded in the early 1960s, but Little Richard's frantic, raucous style is still remembered and he remains one of Rock'n'Roll's true originals. Elvis covered no less than four Little Richard originals in 1956. 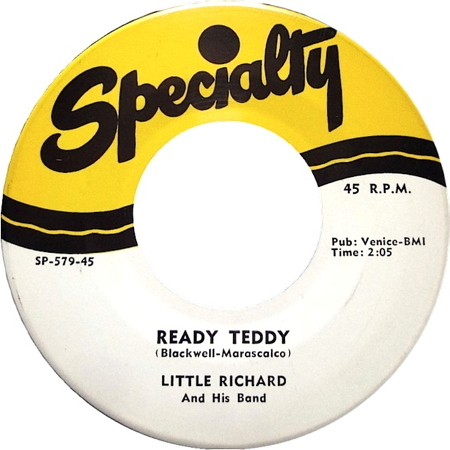 In addition to "Ready Teddy," see also "Long Tall Sally," "Rip It Up," and "Tutti Frutti." 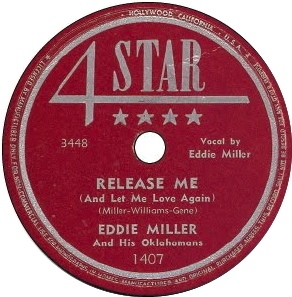 C&W folklore has it that Eddie Miller could find no-one interested in his own number, "Release Me," which he wrote in 1946, so in the end he recorded it himself on Four Star Records in 1949. His original version of his own song was released as a single on 4-Star 1407, but was generally not played because of the apparently risqué number, "Motel Time," on the flip-side. A few years later, Perk Williams, the singer with the Jimmy Heap band, found it and Heap had a minor hit with it, but Ray Price then covered it, too, and had a #1 hit with it and the rest, as they say, is history, for everyone and his mother then recorded the number! Some confusion exists about just who wrote "Release Me." 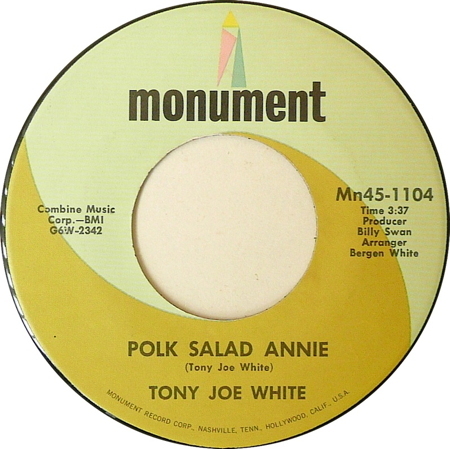 The original 4-Star release showed the writers as Miller, Williams, and Gene (Dub Williams and Bobby Gene Yount were members of the Oklahomans). After the song became a huge success in 1954, however, 4-Star owner Bill McCall decided that he should have his "fair share" of the writing credits, so he bought out Williams' and Gene (Yount)'s share in 1957; Engelbert Humberdinck's massive 1967 version of "Release Me" showed Miller and Stevenson (W.S. Stevenson was a pseudonym frequently used by McCall) in the writers credits. To add to the confusion, the name "Williams" is often substituted by "Pebworth." This is because "Dub Williams" was but the stage name of James W. Pebworth. The Originals author Arnold Rypens asserts that Elvis was offered this number before Little Richard, but refused it! Much like with "Ode To Billie Joe," Elvis gives us just one line of "Running Scared" prior to cutting "Tomorrow Never Comes." 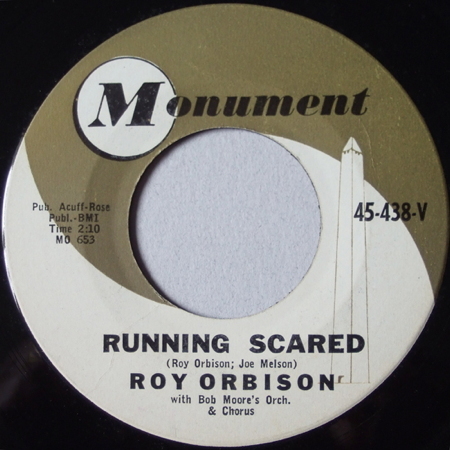 "Running Scared" was written by Roy Orbison and Joe Melson in 1952. It was Roy's fourth million seller and his first American number one. 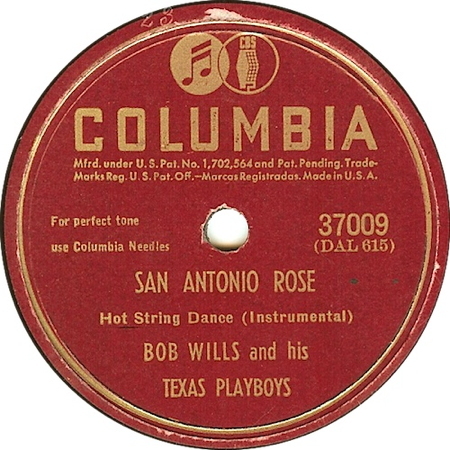 Bob Wills, the "daddy" of Western Swing wrote and recorded "San Antonio Rose" as an instrumental on 28 November, 1938, together with his group, the Texas Playboys. 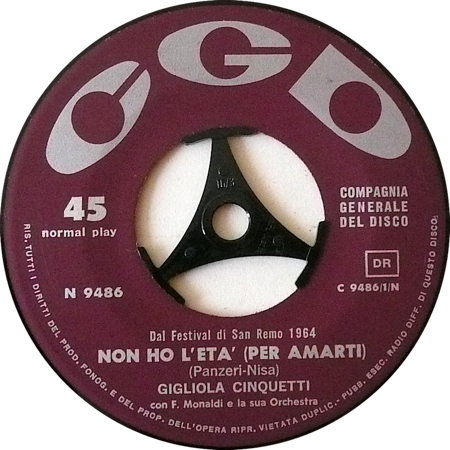 As was the ownt at the time, the recording was issued as a single on several different labels, including Vocalion 04755, Okeh 04755, Conqueror 9226, and Columbia 37009. The singles normally contained matrix DAL 615, but some issues of Conqueror 9226 used matrix DAL 618 instead. "San Antonio Rose" was based on an old fiddle tune called "Spanish Twostep," Bob Wills took the number and made it his theme song. 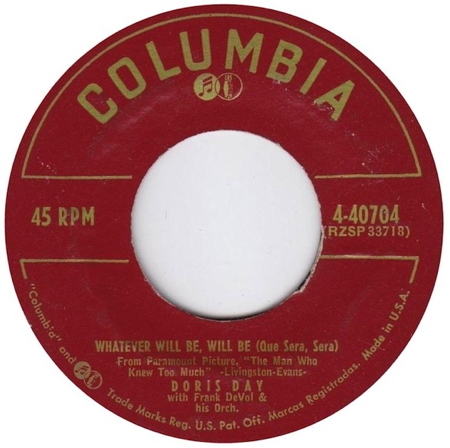 Two years later Wills rerecorded the number, this time with vocal by Tommy Duncan, as "New San Antonio Rose," released as a single on Okeh 05694. Elvis is known to have sung the song on at least one occasion in concert, in the midnight show on 1 September 1970 in Las Vegas: a recording exists. 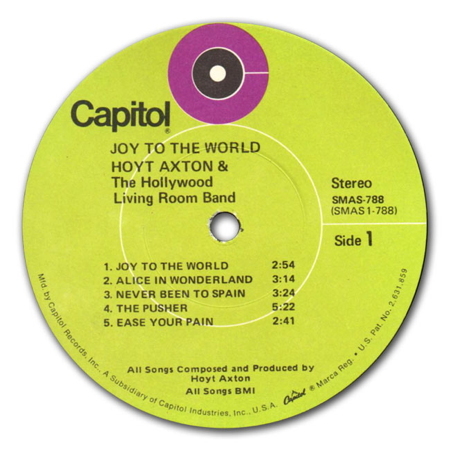 The version on Home Recordings was made in 1966 at Rocca Place, Hollywood, where Elvis often stayed during filming. Martha Carson was born Irene Ambergey in Neon, Kentucky, in 1921. As a small girl she performed on stage with other members of her family and even swapped her pet calf for her first guitar—now that's dedication... She later formed a group with her two sisters and each of them adopted a stage name beginning with the letter "M"—Irene became Martha. Her surname was later changed to Carson when she married James Carson, with whom she appeared as a duo in the 1940s, until they separated in 1950. 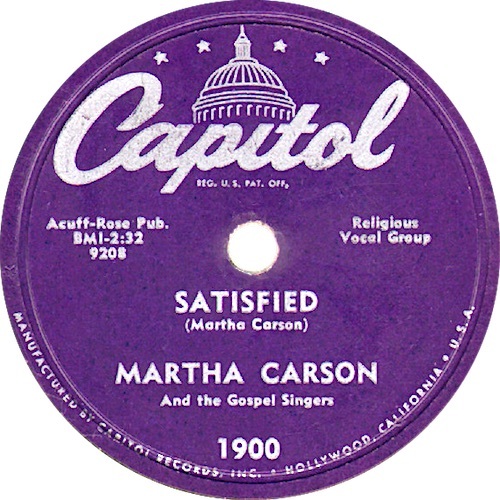 She wrote and recorded "Satisfied" in 1951. The song has been covered well over a hundred times. Elvis recorded "Satisfied" at Sun Studios, but RCA has been unable to find the number on its Sun tapes! Martha Carson died in December 2004. LaVern Baker was born Dolores Williams in 1929. At the end of the 1940s she won her first recording contract with Okeh Records and later moved to Atlantic. There she scored high with Tweedle Dee in 1955. 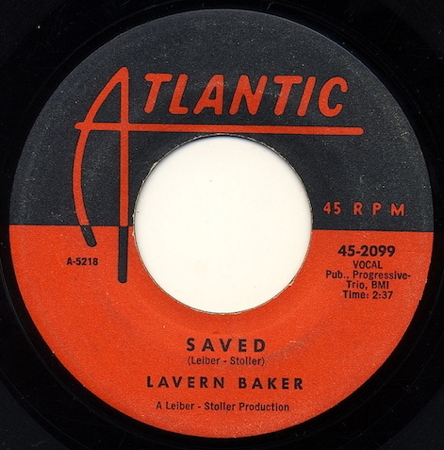 Saved was both written and produced by Leiber and Stoller and her recording was nominated for a Grammy for Best Rhythm and Blues Recording of 1960. Further success was limited, however, and Baker's last chart entry was in 1966 in a duet with Jackie Wilson, Think Twice. LaVern Baker died in 1997.